Trademark East Africa’s Patience Mutesi and RDB’s Emmanuel Hategeka signing the deal on Wednesday. 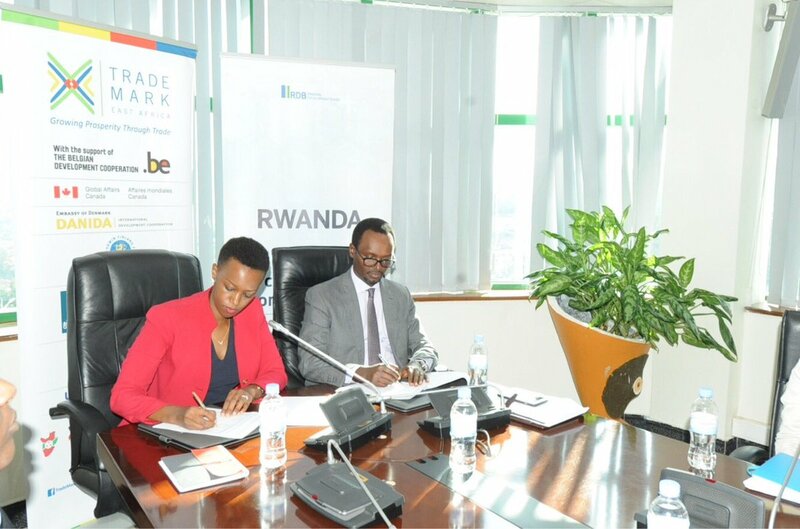 Trade mark East Africa – a regional not-for profit Company has signed a deal with Rwanda Development Board (RDB) to support local companies to export to regional and global markets. According to the terms of the deal signed by Emmanuel Hategeka – Chief Operations Officer at RDB and Patience Mutesi – the Country Director for Trade Mark East Africa, 40 local producers of non- traditional exports will be linked to new markets by 2023 by providing business advisory services for export-ready companies. In addition, Rwandan university graduates will be placed in mentorship programmes to build their capacity in trade policy and export development. This will ensure the long-term sustainability of the outcomes of the programme, Rwanda Development board says. “Growing Rwandan exports and getting the companies to compete at the international markets may seem complex. We believe it is possible with collaboration, which is why we have renewed our partnership with RDB,” Mutesi said on Wednesday shortly after signing the deal at RDB headquarters in the capital Kigali. For Emmanuel Hategeka, supporting local exporters will increase employment opportunities for Rwandans while at the same time helping to reduce Rwanda’s trade deficit. “The partnership with TradeMark East Africa couldn’t have come at a better time,” he said. Meanwhile, the deal comes at a time when Rwanda is promoting Made in Rwanda – a policy that seeks to save the country from the biting trade deficit. The policy whose implementation kicked off last year following a campaign in 2015, has significantly pushed down the country’s trade deficit. Figures from the ministry of trade and industry indicate that the country experienced a 36% decrease in its trade deficit since the launch of Made in Rwanda campaign. According to the ministry, exports increased by 69% from $559 million in 2015 to $944 million in 2017 while total imports decreased by 4% from $1.8 billion in 2015 to $1.7 billion in 2017. From November 28 to December 4, private Sector federation will organize the ‘Made in Rwanda Expo’ – an annual exhibition of local products. The exhibition will feature locally-made products and services from different sectors including Information and Communication Technology (ICT), construction, manufacturing and textile, among others.